A new MonitorIQ 6.0 UI notification screen displays compliance issues such as loudness. 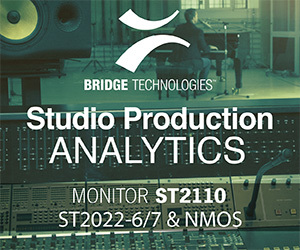 Digital Nirvana recently announced the launch of MonitorIQ 6.0, and will demonstrate the updated comprehensive broadcast-monitoring solution at the 2019 NAB Show. MonitorIQ is Linux-based for maximum security and reliability. It automatically records and monitors linear and/or OTT streams and alerts for loss of video, audio, or closed captions. Monitor IQ 6.0 features include live streaming and recording, SmartSearch, SmartAlerts, and frame-accurate cut clip editing with an option for variable-speed playback. Also included are signal and loudness monitoring, air-check logging, competitive analysis, and content repurposing. A new UI provides an improved user experience and a built-in HTML5 player that eliminates the need to install Flash or ActiveX. The new solution can record inputs from multiple sources, including but not limited to ATSC, SD/HD-SDI, ASI for MPEG-TS, NTSC, and IPTV (TSoIP SPTS and MPTS) for both audio and video streams. In addition to linear channels, the system can record OTT video in full-resolution HD and SD, and the stream can be monitored over the cloud. It supports output formats such as HLS, Flash, MPEG-1/2, MPEG-4, XDCAM, and H.264, making it easy for broadcasters to repurpose content for websites, portable media players, and mobile devices. MonitorIQ can be seamlessly integrated with the Media Services Portal, Digital Nirvana's comprehensive, one-stop suite of closed captioning and metadata enhancement solutions for immediate logging and feedback of content quality and compliance. The integration opens a new world of AI possibilities including automatic closed caption generation, closed caption quality check, and a video intelligence engine to detect ads, logos, objects, and faces. "Today's broadcasters are expected to meet regulatory, compliance, and licensing requirements for closed captioning, decency, and loudness monitoring. At the same time, content producers are on the lookout for efficient ways to review content, ad performance, and placement, which can help them determine effective brand performance, quickly assess competition, and improve and adjust programming," said Russell Wise, senior vice president of sales and marketing at Digital Nirvana.